One of the world's most beautiful locations is the number-one tourist destination. Come and explore the ancient, Renaissance and Baroque delights this magical land has to offer. Almost anywhere is within reach of little towns and villages, isolated ancient remains, mountains or the sea. The principal destination for the rich 'grand tourists' in the 18th and 19th centuries is waiting to welcome you today. 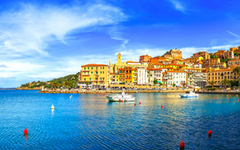 Tuscany, Italy, is distinguished by rolling hills, snowcapped mountains, dramatic cypress trees and miles of coastline on the Tyrrhenian Sea—all of which adds to the gorgeous views at practically every turn. The beauty of the landscape unfolds the region's abundance of art and architecture. Tuscany also produces some of Italy's finest wines and olive oils. The ancient Etruscan influence on regional food—in their use of fresh herbs—still lingers today after three millennia. Simple and earthy, Tuscan food celebrates the seasons with a host of fresh vegetable dishes, wonderful bread-based soups and savory meats and wild game perfumed with sage, rosemary and thyme. Saltless Tuscan bread is grilled and drizzled with olive oil (crostina) or rubbed with garlic and topped with tomatoes (bruschetta). Pecorino, a cheese made from sheeps milk, is particularly good in this region. Boasting some of the most celebrated and respected chefs in the world, Tuscany breathes health, vitality and vigor through its cuisine, bringing its people together with a pride and passion for the foods they prepare and the wines they make, like no other destination on earth. Horizon Club Tours is pleased to invite you to experience Tuscany at Villa Poggiarello in the municipality of Roccastrada, just 90 km south of Florence, hosted by Romeo Innocenti, son of famous Italian Master Chef Carlo Innocenti. You will be immersed in a culturally-rich vacation experiencing cooking demonstrations of Tuscan dishes from centuries-old recipes, tasting the extraordinary wines of the region and visting southern Tuscany cities, towns and villages, off the beaten tourist path, that radiate their ancient splendor of visual wonder.